Eero knocked our socks last year, when the small startup proved that wi-fi routers didn’t need to be ugly, impossible-to-use gadgets. And now, with its second generation of mesh-networking devices, Eero looks like they’ve changed the game again. Not only are the new Eeros faster. They’re ruddy tiny! To be more specific, there are two new types of Eero devices. 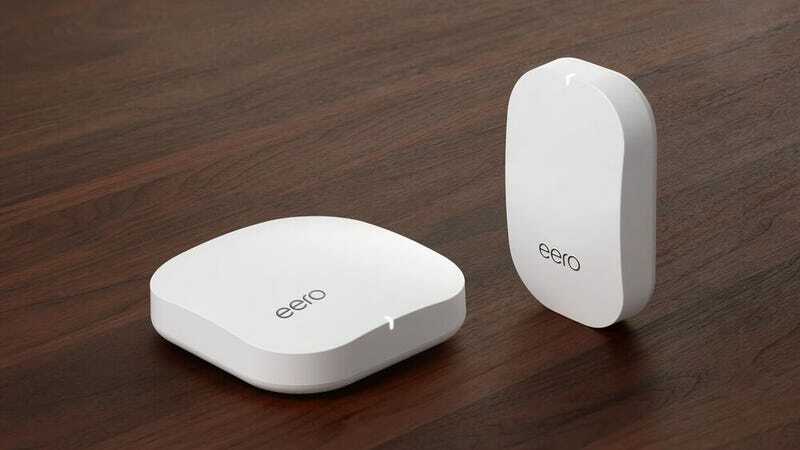 The second generation Eero looks just like the first, but thanks to a third 5 GHz radio, the company says its new routers are twice as fast as the originals. On top of this, Eero is adding an additional piece of hardware called a Beacon, that works just like an original Eero node in the mesh networking ecosystem, but the Beacon half the size and plugs directly into the wall. More on the beacon in a second. Let’s talk speed, right now. The new tri-band spec is a pretty nice upgrade from the original, dual-band Eero. If you’re not familiar with tri-band technology, you need to understand dual-band routers feature two radios: a 2.4 GHz and a 5 GHz. That means it’s compatible with older devices that only operate on a 2.4 GHz signal, as well as newer ones that can handle the faster 5 GHz signal. Adding a third 5 GHz radio effectively adds an additional 5 GHz network. So if your gaming system is slowing down one 5 GHz network, your laptop can connect to the other 5 GHz network to stream video without being affected by the network traffic. In addition to the new radio, the second generation Eero base station includes an extra ethernet port, so you can plug other hardware directly into the router. (The original Eero only had one port.) The whole system features Eero’s emphasis on security, including encryption for all traffic on the Eero network, WPA-2 encryption for devices that connect to the network, and monthly security updates. It’s worth noting that these kinds of features are pretty standard on other wi-fi routers, including Google Wi-Fi, Eero’s main competitor. Now, let’s talk about those Beacons. Whereas the original Eero ecosystem required snaking power cables up stairs and into hallways, these new nodes are about the size of a nightlight but actually extend the Eero wi-fi network throughout the home using mesh networking technology. On top of all that, they also work as customisable LED night lights that can change colour and brightness based on the time of day. To complete this year’s upgrade, Eero is also offering a new security service called Eero Plus. 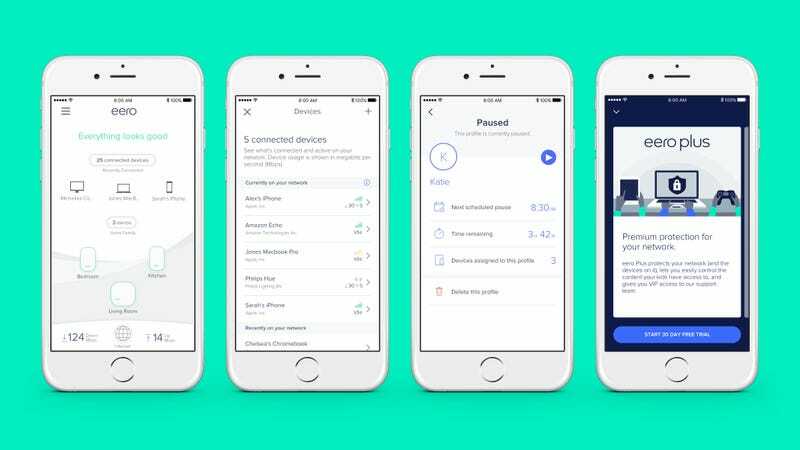 For $10/£7.83 a month or $100/£78 a year, Eero Plus will provide extra defence against malware finding its way into your network, namely from third party devices connected to your Eero. The advanced security feature apparently prevents devices connected to the Eero network from “accidentally accessing sites associated with harmful content, like malware, ransomware, and phishing attacks,” according to a release. The service also comes with enhanced parental controls and VIP support that promises to eliminate wait times any time you call the company’s support desk. This is a potentially cool perk, if you want to keep a close eye on your kids or anticipate having trouble with your new wi-fi router. Otherwise, it’s unclear how useful it would be for an extra $100 a year. The new Eero system—like the original Eero system—doesn’t come cheap. A Home Wi-Fi System with one second generation Eero home station and one Beacon costs $300 ( £235). You can add a second Beacon to the Home Wi-Fi package for another $100 ( £78). (Eero’s announcement didn’t detail the cost of an individual Beacon.) A “Pro Wi-fi System” with three second generation Eeros will cost $500 ( £392). You can pre-order the new Eero systems today, and they’ll start shipping in a few weeks. You’ll also be able to buy the hardware at stores like Best Buy and Walmart in a few weeks. We’ll have to wait until we can test the new Eeros against the old one, before we can know if the new hardware really is twice as fast as the old. But the shift in hardware design from the almost-clunky original Eeros to the almost-invisible Beacons is exciting regardless of the speed. Before you know it, your wi-fi router will probably just be the size of a button and fit into your pocket. That will probably happen next year if this category of gadgets keeps pace with Eero.